In Essen, Germany, the IPM will kick off tomorrow. Starting as an event for the tree nursery business, the IPM Essen has mostly been taken over by breeders, cut flower growers and technical suppliers. This year again various suppliers are to launch new products during the event. What's not to miss? Growcoon with product-specific dispenser and organic approval The Growcoon is finding a continuously expanding customer base in various horticultural segments worldwide. This propagation system is proving especially effective in the rooting of cuttings, in the growing-on of young plants from in vitro systems, and in the use of hydroponic cultivation. The main benefits of using Growcoon for propagating young plants are shorter growing cycles, robust plant health, greater root ball stability and – especially with delicate seedlings – lower failure rates. Many different standard and special sizes are available, as are trays for use with these sizes, which means the Growcoon can be used in all established propagation systems and with different trays. A dispenser specially designed for the Growcoon is now sold by Dutch company Flier Systems. The dispenser is located upstream from the tray-filling machine and automatically places the Growcoons in trays. Alternatively, this can still be done manually. Growcoon is a biodegradable plug with a flexible, open structure. When used in propagation systems, it holds the propagation substrate together and, in this combination, forms a stable root ball. It is made of food-safe components and features the OK COMPOST label certifying it to the EN 13432 standard. This means, for example, that the Growcoon does not entail any pollution risk with respect to farmland, people or the environment, and leaves no harmful residues. The Growcoon was recently included in the ‘Dutch input list’ maintained by Netherlands-based organic control body Skal. This lists products approved for use in organic agriculture in the Netherlands. The Growcoon thus also complies with the European organic-farming regulation. Growcoon is produced by Dutch company Maan BioBased Products B.V. The Klasmann-Deilmann Group holds the global distribution rights to this product. 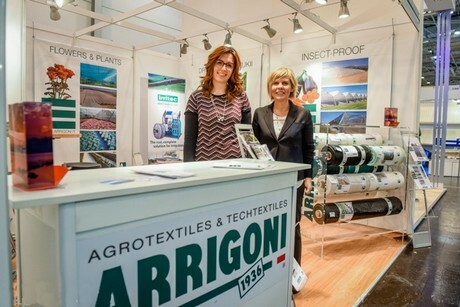 Arrigoni SpA will present to novelties at the IPM Essen. 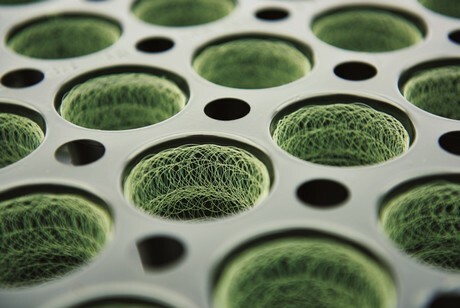 Robuxta, range of thermo-reflective shading screens with LD additive for light diffusion. Thanks to the innovative textile scheme that gives the fabric higher resistance to abrasion, Robuxta is specifically designed for use on tensile structures (Net-houses), greenhouses and tunnels with direct application. "We will bring to this exhibition solutions – explains Giuseppe Netti, agronomist of Arrigoni– that match the needs of all operators who will visit the show, since the entire supply chain will be present, ranging from plant propagation to the producers of flowers". 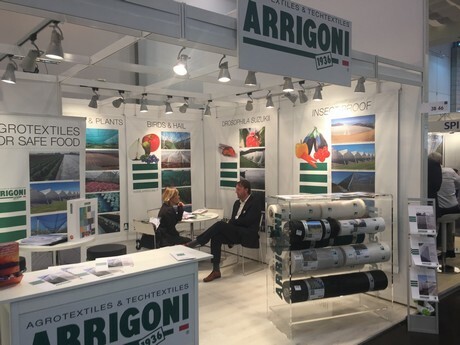 Arrigoni will be present at IPM Essen (Hall 3 stand B46 from January22nd to 25th, 2019). HortiHygienz can be used worldwide as a total concept. Advice and products are tailored to the risks, customer requirements and local circumstances, anywhere in the world. "Whatever the question or challenge in the field of company hygiene, HortiHygienz has a solution for you", the team explains. Find Royal Brinkman on the IPM Hall 3, stand 3D34. Biobest has chosen IPM Essen, the world’s leading horticultural trade fair, to promote its multi-pronged IPM solutions for thrips, mealybug and sciarid control in pot plants. A wide range of ornamental crops are highly susceptible to damage from thrips, mealybug and sciarid - three challenging pests. To maximize effectiveness, Biobest’s biocontrol strategies target each pest above and, where appropriate, below the soil surface. For example, for effective control of thrips Biobest’s multi-pronged strategy combines monitoring with control solutions above and below the soil surface. For above ground control, the programme consists of Bug-Scan® blue in combination with Thripher pheromone, the predatory mites Swirskii-System (Amblyseius swirskii) and Montdorensis-System (Amblyseius montdorensis) with the feed supplement Nutrimite™. Foliar applications of the parasitic nematode Steinernema-System (Steinernema feltiae) are also recommended. The soil-dwelling thrips pupae are targeted in the soil with Hypoaspis-System containing the predatory mite Stratiolaelaps scimitus, the predatory beetle Atheta-System (Atheta coriaria) and the parasitic nematode Steinernema-System. Do you want to find out more about these strategies? Visit Biobest at IPM Essen in Hall 3, booth 3B21.